Archive - Short trip to Ireland. My wife has taken our baby off to visit her parents for a few weeks, leaving me at home and now working a 4-on 4-off shift pattern. This gives me plenty of time off, even if every other shift block are nights. 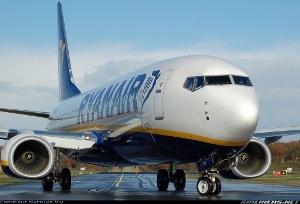 Anyway, Ryanair had one of their sales, so after a quick phone call to my sister, I booked us a day trip from Stansted to Dublin for the sum of £1 each way each, including all taxes and fees (I made sure to get an Electron card a couple of years ago - has already saved me £100+). Time advanced, and clearly the autumn loads on FR weren't looking as good as they'd hoped, so they introduced a 1p sale. DUB was sold out by the time I looked, but there were seats available at that price (does 1p even count as a price?!) from Knock the following afternoon. I quickly got the Electron out and spent the sum of 2p on some tickets. The original plan was to use it as backup in case we missed the Dublin flight, but we soon thought about planning for a 2-day quick trip. A rental car was booked for 30EUR for the 24 hours, and a bargain hotel found in the west of Ireland - the Radisson Blu in Sligo. Pretty uneventful really, my sister picked me up at 6am and we drove to STN, stopping at the Thetford McDonalds for a greasy breakfast. I'd prebooked parking at the long stay, so we turned in. Looks like they've changed their system, as instead of inserting the card used for the booking, the machine spat out the ticket straight away, complete with car rego printed on it. After finding a spot and the shuttle bus, we entered the terminal, and my sister was pleased that we could proceed directly to the security checkpoint, as she'd never used the FR online checkin without luggage before. A quick phone call to my wife in SA before heading abroad and costs escalating and we headed to the gate. Gate 42 at STN is at the terminal end of the satellite, and we were in the first 5 people to join the queue. At this gate there are seats in the "Standard" queue, but not the priority queue, not that it bothered us to sit and wait! People started arriving, and so did the gate agent, all before the incoming aircraft. Priority started "boarding" just as the aircraft, EI-DPN, arrived and started disgorging its passengers. We, meanwhile, were waiting on the enclosed stairwell. Eventually we boarded, going round to the rear stairs, and made our way forward. We made it to the emergency exit row, so got an acceptable amount of legroom, unlike their normal seats. This aircraft was apparently equipped with moble phone reception, but the crew didn't mention it, except to say that phone useage was not allowed. Take off was normal, a bit of minor turbulence as we climbed through the clouds but nothing more. We didn't buy anything, and before we knew it we were on final approach to landing. Touchdown was a little rough, but it was quite windy. I could clearly see the reverse thrusters on the side of the engine. After passing through passport control, we proceeded to the car rental desks to pick up our car. We were a bit (ok, nearly 2 hours) early, as I wanted to book 24hours rental to save a day's fees. We were directed from the Budget desk through the new-looking car park building (that had a cafe on the ground floor) to the rental office - or rather portacabin. We picked up the car, and paid for the extra insurance, the one-way fee to Knock Airport, and an mysterious "airport surcharge fee" that we were so far unaware of. We then hit the road. Not very quickly, as there were roadworks for miles, along the M1, M50 and N3. A new motorway is being built alongside the N3, so periodically we'd cross it and the attendant earthmoving equipment. We stopped in the village of Kells (of Book Of fame, in Dublin) for lunch, and onwards to Cavan for a quick visit to the crystal factory (which looked suspiciously like a hotel with a large crystal shop attached). We figured we'd take the scenic (according to the map) route to Sligo, which meant crossing Northern Ireland. We followed a Google Streetview car for about 5 miles along the A509 into Enniskillen, from where we took the A46 alongside a beautiful lake. Pity the weather was drizzly. On reaching the coast and back to the republic, we turned left and headed for Sligo. The hotel is just outside, and very nice. Free wifi in the room, all mod cons, and a normal fridge minibar. We decided to head into Sligo for dinner. Now Sligo is a nice enough small town, but somewhat limited in dining options. In the end we headed to a modern-style bar that was recommended in the Lonely Planet guide. Food was very nice, but the highlight was the fact that some of the tables had their own Guinness and Carlsberg taps! You leave a credit card behind the bar as deposit, and your consumption is recorded on a little LCD screen on the tap. The following day we headed out after breakfast, back into Sligo town in daylight. We saw the abbey ruins, and found woman's ideal shop, selling shoes, handbags and chocolate. Heading out of town we aimed for Knock, the village. This time of year we were expecting it to be deserted, but there were still a few people lingering around the church where in the 1800s some girls saw an apparition of the Virgin Mary. We stopped in a couple of the open souvenir shops (about 90% of them were closed) and admired the Mary snowglobes and flashing lights, before heading back to the airport. We arrived a couple of hours before departure, but the airport is really quite small. The new terminal design does look like most new Tesco supermarkets from the outside though. Knock, along with several other smaller airports, charges a further EUR10 "Airport Development Fee". I don't object to paying this, but like all airports it should be included in the "taxes and fees" payable on ticket purchase. Nevertheless, we paid the fee and went through security, after heading upstairs to the cafe for lunch overlooking the apron. 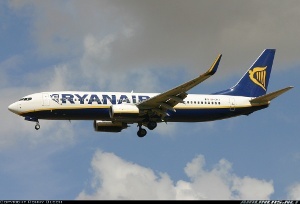 Again, the return flight was uneventful, arriving ontime like the outward flight and prompting the famous Ryanair fanfare. Aircraft was EI-DHJ, without mobile phone systems. On arrival, we proceeded through the Ireland Bypass for passport control, found my sisters car back in the car park, and headed home. I didn't take any on the outward flight, but there are some of aviation interest towards the end. Look out in a couple of weeks for a 5 day, 5 flight, 5 country, 4 airline trip around Europe!